Cheri Says: "Scanners are Cool"
Isn't she cute! 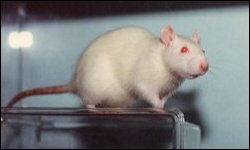 This is FreeFall, my psychotic albino rat. I had her in the early 90's or so. Little Adric, snuggling in my bed. I'm guessing this is a pic from 1996. 1997. 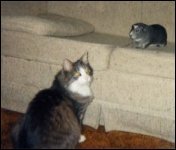 My parents cat, Mittens, never bothered Adric the guinea pig. Remember the Roswell Road Trip? This is Adric and me, sitting in a space capsule outside the space museum. 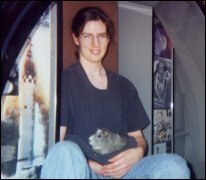 I could not leave Adric out in the car, and the people there were really cool to let me carry him around the museum.